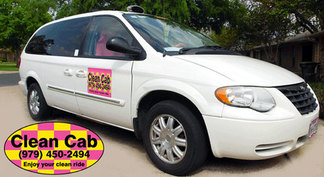 Clean Cab is a taxi service in College Station and Bryan TX. Assure services by booking taxi in advance for longer trips. Mini vans for hire to Houston & Austin airports. Clean Cab is a female owned company striving to provide superb customer service. It's a simple concept. We have a taxi driver bio & photo page if you would like to meet us. Best cab service in College Station. Always answers the phone and always picks up! Cabs are always clean and one of the best rates. The driver is really cool! I would recommend this cab to everyone I know. I have lived in the Bryan-College Station area for a few years now and I have taken several cabs, Clean Cab has been my best taxi experience by far. The owner of this business makes sure that the cab lives up to it's name. Drivers are completely certified , very nice, safe and prompt. New: Lower taxi fare flag drop rates. Closed Sunday 6 AM, Service resumes Monday morning. ﻿﻿As a taxi cab driver I would be lying if I said I've never texted any of our customers back while driving. On the other hand they're text messages we created especially for customers. "Call you back shortly, I have a customer in the cab at the moment" that we send with one click. Clean Cab is a female owned small business. Obvious by the yellow and pink door signs.